This is one of the hardest posts I've ever written, because it's one of the hardest decisions I've ever made. So, I'm going to do my best to share where I started (for those of you who don't know my whole story), and what changed that led me to this choice today. All of us with autoimmune disease face medication decisions at different points in our lives. This post isn't meant to be advice for anyone else. I'm just sharing my journey. Four years ago, rheumatoid arthritis hit my life like a wrecking ball. I went from a fit, healthy woman who worked full-time as a massage therapist and hiked on the weekends for fun, to someone who limped crossing her living room and didn’t have the strength in her hands and wrists to wash dishes. I was introduced to a level of pain so unlike any I had experienced before that I think it deserves its own word. I woke up in the morning feeling 90 years old, and that was the good part of my day. Every night like clockwork, a joint would flare so extremely that I would have to immobilize it or I would be gasping and crying with pain. If it was my wrist, it went into a brace. If it was my shoulder, it went into a sling. If it was my knee, I could no longer support my weight. And if it was my jaw, I couldn’t open my mouth to speak or to eat. Painkillers barely took the edge off. I was terrified and didn’t know how I could survive it. Most people in my position would have taken the medications offered by their rheumatologist. But like many of you, I was terrified of the side effects and hated the idea of a lifelong medication. So, I desperately searched for another way. First, I found the GAPS diet which took me out of crisis. Then, I found the Paleo Autoimmune Protocol, which reduced my symptoms by 95% and stopped my flares altogether. I wasn’t in remission – I could feel RA like a whisper in my body, but I felt so much better that I was filled with relief and gratitude. I also felt better than most people I knew with RA who were taking immunosuppressant medication. My improvements didn't happen overnight. They were slow and steady over the course of a year. I went from excruciating pain every day, to moderate pain, to pain so mild that I could manage it completely with just one Aleve tablet twice a day. I went from being unable to work, to working part-time, to eventually working full-time again. I also returned to the mountain hikes that I loved, and could do all of the chores of daily life from cooking to cleaning to gardening, with joy. Supplements: Some helped me, some hurt me, and some had no effect whatsoever. Curcumin and Cat’s Claw have been the most helpful for me, with Curcumin acting as an anti-inflammatory and Cat’s Claw acting as an immunoregulator. However, neither replaced my need for Aleve. Low-Dose Naltrexone: This is actually a prescription medication, but one that most rheumatologists will not prescribe. Instead, it’s offered by functional medicine MDs in place of immunosuppressant medication. It’s much milder with fewer side effects, and some people have dramatic improvements on this drug. For me, it improved my morning stiffness enough to be worth taking, but it had no benefit beyond that. Functional Medicine Testing: I had blood, stool and urine tests done in 2014 and 2015 which didn’t reveal any major obstacles to my healing. My metabolism, digestion and nutrient absorption were all strong. My blood sugar and cholesterol levels were within healthy ranges. My thyroid hormones were optimal. My methylation was working well in spite of having a heterozygous MTHFR mutation. My liver, kidneys and adrenals showed optimal function. There were no yeast, parasites, fungi or true dysbiosis. There were some minor imbalances between beneficial and harmful bacteria, along with signs of leaky gut. Since leaky gut and autoimmune disease go hand in hand, this wasn’t a surprise. However, the hope was that by improving the balance of my gut bacteria, we could eliminate my remaining RA symptoms. I was put on an herbal antibiotic + probiotic protocol. Unfortunately, this resulted in no change at all. Don’t take this as an argument against functional medicine testing. Many people do find clear problems that once addressed dramatically improve their autoimmune symptoms. However, they often aren’t people who are already feeling 95% better. Lifestyle: The paleo autoimmune protocol isn’t just about food. I also addressed factors outside of diet, like sleep, sunshine, movement, stress, meditation, emotional work, etc. They all contribute to how well I feel every day, but they haven’t put me in remission. Eventually, I came to a peace about not being in remission, and simply felt grateful for the quality of life I had with a disease that I knew could be debilitating. My improvements in RA symptoms stayed stable for two years. Then, my hormones shifted, and everything else did as well. I hit perimenopause, and my menstrual cycles started ranging between 3-1/2 and 10-1/2 week cycles. With that shift came swollen ankles, difficulty sleeping, and my first experience with adrenal fatigue. Simultaneously, I started having miniature RA flares. They reminded me of RA onset but they were much less severe (thankfully). The inflammation moved around my body from joint to joint, but I didn’t need to immobilize joints or take additional painkillers. However, something else happened which was new and very scary – I started experiencing rapid joint changes simultaneously. I lost my ability to make a fist as well as significant range of motion in my left shoulder. I took steps to try to balance my hormones, but that takes time, and my joints were getting damaged right now. This was one of the toughest decisions I’ve ever made. I passionately hoped I would never need immunosuppressant medication. But as I went from a woman who raised her arms overhead in celebration, to one whose left arm was now stuck by her side, the vision of shoulder replacement surgery appeared in my mind. That scared me more than medication. So, I consulted with two rheumatologists. Neither dismissed the paleo diet out-of-hand, which is amazing. They both said that diet can help with pain relief, and the second rheumatologist actually recommends paleo to her patients as an adjunct to medication. She also gave paleo credit for slowing down my disease progression over the past four years. However, they both agreed that it was time to try medication, to see if we could actually stop the disease progression altogether and ideally reach remission. Their recommendations were identical: methotrexate + prednisone + a biologic. I was shocked. That is a triple combination of the strongest medication available for RA. I had hoped a milder medication like plaquenil and sulfasalazine would be enough for me. I was told that those can be effective for mild RA, but I have severe RA that is actively changing my joints. This combination is my best chance at stopping that progression quickly and regaining range of motion. In spite of my experience successfully avoiding medication for the first four years after onset, I’ve never been anti-medication in theory – at least when it came to other people. In fact, in my Navigating Setbacks article, I wrote that sometimes diet + medication is the answer. I’ve always supported my readers who have made that choice. Now, it’s time to support myself in that same decision. 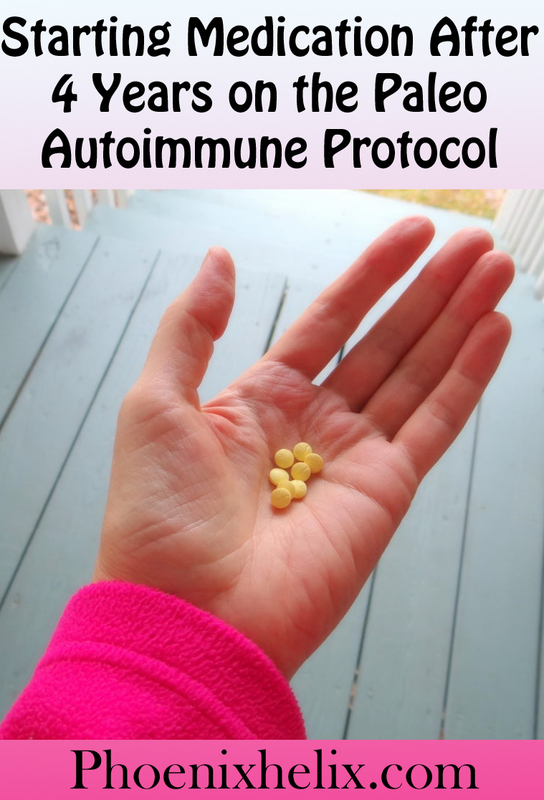 Does This Mean the Paleo Autoimmune Protocol (AIP) Doesn’t Work? The AIP reduced my symptoms by 95%, and I maintained that improvement for years. Even when I had a resurgence of symptoms, it wasn’t as severe as rheumatoid onset. The AIP didn’t cure me, but it has certainly helped me, and I won’t be stopping just because I’m trying medication. I want to give my body the best chance possible to reach remission. The American College of Rheumatology has a set of criteria to determine if a drug is successful. If you search Pubmed for clinical trials, you’ll see the abbreviations ACR20, ACR50 and ACR70. That stands for 20, 50 and 70 percent improvement in symptoms. A drug only has to have 20% improvement for just some of the patients in the trial, to be considered successful. The higher the percent improvement and the more people who experience benefit the better. For me, the AIP surpassed these percentages. Do I Wish I Started Medication Sooner? We can second-guess ourselves and each other, but when it comes to autoimmune disease, outcomes are unpredictable. I've done a lot of research into RA medication, and the statistics aren't encouraging. 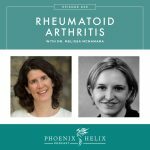 While rheumatologists tell us that early, aggressive treatment is the best chance of stopping joint damage and achieving remission, sustained remission is rare. The same is true for stopping joint damage – slowing it down is a more achievable goal, and paleo did actually do that for me. In addition, the drugs work at varied effectiveness from person to person: Only 1 in 7 people receive 50% improvement when taking methotrexate. 1 in 4 people receive 50% improvement when taking biologics. And that statistic increases to 1 in 3 when they are combined. This means that the majority of people aren't reaching that level of benefit. In addition, pain remains a problem even when taking immunosuppressant medication. In a survey of RA patients, 65% need steroid and/or anti-inflammatory medication in addition to their immunosuppressants, and many still experience pain in spite of all the medication. I don't believe people should simply ignore rheumatoid arthritis, but you can see my reasoning behind trying paleo first. If I could go back in time, I would do the exact same thing. I needed to know what diet & lifestyle could do for me, before making any kind of peace with taking medication. That doesn’t mean I’m advocating this choice for others. After seeing those statistics, you might be wondering why am I trying medication now? Because it’s possible I am one of the statistical minority. Many people come to paleo because the drugs fail to help them. I’ve never given the drugs a chance. And one thing the statistics don’t show is that sometimes through trying different medications, you’ll find the one that does work for you. Here’s my belief: having autoimmune disease innately carries risks, and since there is no cure and also no treatment that’s guaranteed to be effective for everyone, every choice is a gamble. I made the best choice for me in 2012, and I’m making the best choice for me now in 2016. But it wasn’t just poor statistics that made me avoid immunosuppressant medication. It was also fear of the side effects. And it’s a very real fear that hasn’t gone away. Timing – While my doctor wants me to take all of these drugs simultaneously, I'm someone who needs to introduce one drug at a time, so I can feel how it works in my body before adding another. I'm taking methotrexate first and giving it two months to see what it can do for me on its own. If my joints continue to worsen, I will add the biologic. The prednisone is a separate decision. It's designed to rapidly reduce inflammation in the body, but it doesn't prevent joint damage, which is my main problem right now. Whether I take it will depend on how my symptoms progress. Methotrexate – Isn’t methotrexate a form of chemotherapy prescribed for cancer? While true, this is a misleading statement. When methotrexate is used as chemotherapy to treat cancer the dose is 100 times stronger. So, while it’s the same drug, it’s not the same thing. Still, it comes with a host of potential side effects from nausea to hair loss to mouth sores to liver damage. This is because it's a folate antagonist – which is a nutrient that our cells need to thrive. This can potentially help RA by interfering with the cells attacking my joints, but unfortunately it also interferes with other cells such as those lining the gut, mouth, hair follicles and liver. 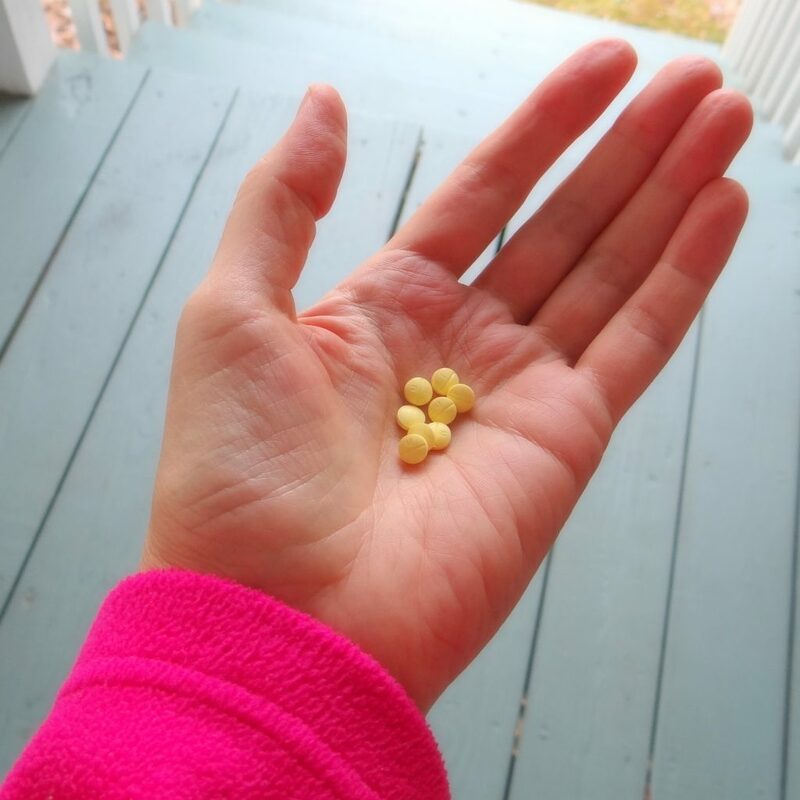 Here are the steps I'm taking to minimize my side effects: (1) I had my genetic testing done, combined with a urine organic acids test to determine if I have any methylation problems. People with a double MTHFR mutation are more likely to have trouble with this drug. I have a single mutation, but my testing showed that my methylation capacity is currently strong. (2) My rheumatologist prescribed 800 mcg folic acid to help prevent/alleviate those side effects. I'm taking methlyfolate instead. Folic acid is a synthetic compound that the body has difficulty processing and can cause its own side effects. Folate is the natural vitamin found in many foods recommended on the paleo autoimmune protocol, such as chicken liver, dark leafy greens, broccoli, asparagus and avocado. I eat a lot of these already and will continue to do so, but I will need a supplement too. Methylfolate is a supplement that is bio-available (easier for the body to absorb and use). (3) I'm taking it before bed, to “sleep off” some of the side effects. (4) I'm also avoiding all alcohol as a liver protective measure. I only drank 1-2 glasses of wine/month anyway. Prednisone – This is a powerful anti-inflammatory that can save lives, but the damage it does to the body is very real. The potential side effects are too numerous to list. While famous for weight gain and mood swings, what scares me more is the risk of spinal fracture, cataracts, organ damage, developing diabetes, and developing an addiction to the steroids themselves. If I take prednisone, I will also take a bioavailable calcium supplement, continue my practice of getting vitamin D through sunshine, monitor my blood sugar, support my adrenal function and lower my dose if the side effects are severe. I also have no intention of taking this long-term. It’s designed to be a bridge medication to quickly reduce inflammation while giving the other medications a chance to work. The longer I'm on this medication, the higher the risk of damage to other parts of my body, and also the harder it is to taper off this medication. Biologics – While these drugs have the best statistics for slowing down joint damage, which is my goal, they also carry the risk of cancer, serious infection and even developing another autoimmune disease. That’s very scary. Thankfully, these are rare occurrences, but if you’re that rare occurrence, it’s no comfort. That's why I'm trying methotrexate on its own first. But if I don’t respond and I continue to lose range of motion in my joints, I've decided that I will try the biologic. Unfortunately, there is no supplement to minimize side effects. Instead, I just need to watch closely and notify my doctor at any sign of a problem. When Will I Know If It’s Working? This is one of the frustrating things about immunosuppressant medication. You feel the side effects immediately, but it usually takes months to see if a medication is working or not. If not, you try another one, which again takes months. While some people see results right away, for others it can be a year + of experimentation. Usually, I write about my experiments after I have the results, but this experiment is going to take too long for that. I routinely get asked if I’m still medication-free, and I want to be open about this decision. I’ll write a follow-up post once I know my results – positive, neutral or negative. Send wishes my way for positive! Autoimmune disease is an emotional rollercoaster. I think we all know that. But this decision has been intense. If you’ve seen me post on social media about courage, stress management and self-care, this is one of the reasons why. I’ve been struggling with this choice for a while. I hope that this medication will help me, but fear that it won’t. I feel resentful that we’re given a Sophie’s Choice when it comes to medication – that in order to save my joints, I have to put the rest of my body at risk. My hope is that I’ll tolerate the medication with minimal side effects; my fear is that I’ll be one of the rare severe side effect cases. So, what do I do with these conflicted feelings? I can’t hate taking this medication and expect it to succeed. The mindbody connection can work both ways – there is something called the “nocebo effect.” If I’m going to do this, I need to embrace the positive possibilities. So, I’ve been doing more meditation and visualization and focusing on self-love, but the technique that helped me most was a facilitated session of The Work by Byron Katie. My fears were so huge, I couldn’t see around them. The Work helped me see that they are based on a future that may never come to pass. It helped me make peace with the unknown. Now, when I take my medication, instead of saying, “I hate this!” I say instead: “I’m grateful to this medication. 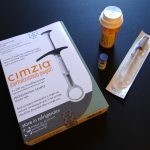 It will either help me or teach me.” No matter what happens, at the end of this medication experiment, I will know a lot more about myself and my body. When you’re in a community of people striving to heal outside of the conventional medical model, there can be a lot of shame about taking medication. I think we’ve all felt it. I also think we judge ourselves far more than anyone else. We often take it as a personal failure when our autoimmune disease can't be managed with diet and lifestyle alone. When others judge us, I think it's a projection of their hopes and fears. Many of us want to be medication-free, so we can get upset when someone next to us starts taking medication. The mirror can be frightening. As a public figure in this community, I understand that people might take my experience especially to heart. If after reading this, you are feeling disheartened or discouraged that I didn’t achieve perfect healing, don’t let that discourage you for long. First of all, we are all unique. Just because I didn’t achieve a medication-free remission doesn’t mean you can’t. Secondly, perfection isn’t the only definition of success. I am still so far from the rock bottom of 2012. I’m not disabled. I’m not in excruciating pain. I have a full and beautiful life, and this new challenge and new decision doesn’t change that or take away the improvements I achieved through diet and lifestyle. Nor does it impact what you can achieve. When I was first diagnosed with rheumatoid arthritis, I was anti-medication, believing it did more harm than good. Since then, I’ve communicated with thousands of people with autoimmune disease, and I’ve seen the full spectrum of experience and need for medication. I’ve written articles and social media posts, trying to remove medication shame, and others have done the same. It doesn’t mean I’m pro-medication now, even with my recent decision to try it myself. I know people who have had negative reactions, and others who don’t need it at all. I just think that as a community, we need to make peace with the complexity of autoimmune disease and autoimmune healing. This journey is about using all of the tools at our disposal to live the best life possible with autoimmune disease. Diet and medication don’t have to be either/or choices. It’s up to each of us as individuals to make the best choice for ourselves, and we shouldn’t be ashamed of (or shamed for) those choices. I'm a strong woman who doesn’t stay down when she gets knocked down. I'm a smart woman willing to search for her own answers and ask for help when she needs it. I'm a brave woman willing to face her fears head-on and step into the unknown. And I'm a loving woman who strives to lift people up, be honest about my journey, and encourage compassion for everyone, myself included. This website has a disclaimer on its legal page that is always in effect, but since I’m talking about medication here, I want to remind everyone that I’m neither a doctor nor a dietitian. This blog is designed to chronicle my own health journey, share what I learn in the process, and connect with others on a similar path. 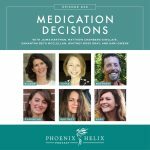 Today, I’m sharing my experiences with medication decisions. In my next podcast, I’ll be interviewing others about their medication decisions (and they’re all quite different). This doesn’t mean I think you should imitate me or anyone else that I interview. We are all too unique for that. Always make your decisions in consult with your doctors. My blog is not meant to be a substitute for medical advice. In 2017, I wrote an update to my medication experiment, which you can read here. 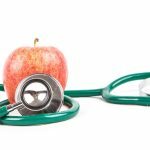 Do Paleo-Friendly Autoimmune Specialist MD's Exist?